To the west of the Red Fort stands the old walled city of Shahjahanabad. Fragments of the sturdy wall that surrounded city can still be seen. The northern end of the walled city, called the Kashmir Gate, was the scene of fierce fighting when the British retook Delhi during the Mutiny. The British-erected Mutiny Memorial to the soldiers who lost their lives during the uprising can be seen near the Sabzi Mandi. Close to it is an Ashoka pillar, and like the one in Feroz Shah Kotla, it was brought here by Feroz Shah Tughlaq. CHANDNI CHOWK : The colourful shopping bazaar known as Chandni Chowk is the main street of Old Delhi. The Sunheri Masjid stands next to the Kotwali (old police station). On the roof of this very mosque, in 1739, Nadir Shah, the Persian invader who carried off the Peacock Throne when he ransacked Delhi, stood watched while his soldiers conducted a bloody massacre. The Fatehpuri Mosque, erected in 1650 by one of Shah Jahan's wives, stands at the west end of Chandni Chowk. RED FORT : The red sandstone walls of Lal Qila, the Red Fort, extend for two km and vary in height from 18 metres on the river side to 33 metres on the city side. Shah Jahan started construction of the massive fort in 1638 and it was completed in 1648. Before he could move his capital from Agra to Shahjahanabad in Delhi, he was deposed and imprisoned in Agra Fort by his son Aurangzeb. Entry to the fort is Rs 0.50; free on Friday. LAHORE GATE : The Lahore gate, the main gate to the fort, gets its name from the fact that it faces towards Lahore, now in Pakistan. It leads to a vaulted arcade, the Chatta Chowk (Covered Bazaar). The shops cater to the tourist trade today, but once they stocked articles for royal households - silks, jewellery, gold. This arcade was also known as the Meena Bazaar, were ladies of the court shopped. On Thursdays, men were barred from entering the fort and only women were allowed inside the citadel. The arcade leads to the Naubat Khana, or Drum House, where musicians used to play for the emperor, and the arrival of princes and royalty was heralded from here. DIWAN-I-AAM : The Hall of Public Audiences. Here, in a marble-panelled alcove, set with precious stones, the emperor would sit to hear complaints or disputes from his subjects. It was badly looted in the mutiny. This elegant hall was restored as a result of a directive by Lord Curzon, the viceroy of India between 1898 and 1905. DIWAN-I-KHAS : The Hall of Private Audiences; Here, in this luxurious chamber built of white marble, the emperor would hold private meetings. Centerpiece of the hall (until Nadir Shah carted it off to Iran in 1739) was the magnificent Peacock Throne. ROYAL BATHS : The Hammams or baths - were large rooms surmounted by domes, with fountains in the centre - one of which was set up as a sauna ! The floors used to be inlaid with pietra dura work, and the rooms were illuminated through panels of coloured glass in the roof. The baths are now, closed to the public. Shahi Burj, a three-storey octagonal tower at the north-eastern edge of the fort, was once Shah Jahan's private working area. Moti Masjid, built in 1659 by Aurangzeb for his own personal use is a small and totally enclosed Pearl Mosque, made of marble, next to the baths. A very interesting feature of the mosque is that while its outer walls are oriented to be in symmetry with the rest of the fort, the inner walls are slightly askew, so that the mosque has the correct orientation with Mecca. OTHER FEATURES : The Khas Mahal, standing to the south of the Diwan-i-Khas, was the emperor's private palace, It had rooms for worship, sleeping and living . Further south stands the Rang Mahal or Palace of Colour, so-called because of its painted interior, which is now gone. This was the residence of the emperor's chief wife, and this was also where he ate. The floor in the centre has a beautifully carved marble lotus, and the water flowing along the channel from the Shahi Burj used to end up here. Originally a fountain made of ivory stood in the centre. Still further south along the eastern wall is a small Museum of Archaeology in the Mumtaz Mahal, which is well worth a look. In between all these exquisite buildings were the highly formal Charbagh gardens, complete with fountains, pools and small pavilions. While the general outline and some of the pavilion are still in place, the gardens are not what they once were. SOUND & LIGHT SHOW : An event of Indian history, particularly those connected with the Red Fort is re-created each evening through the interesting sound & light show. Shows are in English and Hindi, and tickets (Rs 20) are available from the fort. The English session are at 7.30 pm from November through January, 8.30 pm from February to April had September-October, and at 9 pm from May to August. It's well worth making the effort to see this show. JAMA MASJID : The great mosque of Old Delhi is both the largest in India and the Final architectural extravagance of Shah Jahan. Commenced in 1644 , the mosque was not completed until 1658. It has three great gateways, four angle towers and two minarets standing 40 meters high and constructed of alternating vertical strips of red sandstone and white marble. There's a Rs 15 fee to take a camera inside to mosque, and another Rs 15 to take it up the minaret. CORONATION DURBAR SITE : This is a must for incurable Raj fans looking for their fix of nostalgia. It's north of Old Delhi and is best reached by auto-rickshaw. An obelisk marks the site where the durbars were enacted between 1877 and 1903. It was also here in 1911 that King George V was declared emperor of India. FEROZ SHAH KOTLA : The ruins of Ferozabad, the fifth city of Delhi, erected by Feroz Shah Tughlaq in 1354 can be found at Feroz Shah Kotla, just off Bahadur Shah Zafar Marg between the Old and New Delhi. A 13-metre-high sandstone Ashoka's edicts (and a later inscription) can be seen in the old fortress palace. Also to be seen are the remains of an old mosque and a fine well. But most of the ruins have been used for construction of later cities. RAJ GHAT : A simple square platform of black marble north-east of Feroz Shah Kotla, on the banks of the Yamuna, marks the spot where Mahatma Gandhi was cremated following his assassination in 1948. A commemorative ceremony is held every Friday, the day he was killed. Just to the north of Raj Ghat, at Shanti Van, Jawaharlal Nehru, the first Indian Prime minister, was cremated in1964. His daughter, Indira Gandhi, who was killed in 1984, and grandsons Sanjoy (1980) and Rajiv (1991) were also cremated in this vicinity. The Raj Ghat area is now a beautiful park, complete with labelled trees planted by a mixed bag of notables including Queen Elizabeth II , Gough Whitlam, Dwight Eisenhower and Ho Chi Minh ! PURANA QUILA : Purana Qila is the supposed site of Indraprastha, the original city of Delhi. The Afghan ruler, Sher Shah, who briefly interrupted the Mughal Empire by defeating Humayun, completed the fort during his reign from 1538-45, before Humayun regained control of India. The fort, located south-east of the India Gate and north of Humayun's Tomb and the Nizamuddin railway station, has massive walls and three large gateways. There is a small octagonal red sandstone tower, the Sher Mandal, in side the fort near the South gate. It was later used by Humayun as a library. While descending the stairs of this tower one day in 1556, he slipped, fell and received injuries from which he later died. The Qila-i-Kuhran Mosque, or Mosque of Sher Shah, lies just beyond it and unlike the fort itself, is in a fairly reasonable condition. There's a small archaeological museum just inside the main gate. There are good views of New Delhi from atop the gate. HUMAYUN'S TOMB : The tomb is an early example of Mughal architecture. Humayun's senior wife Haji Begum had it built in the mid-16th century. This earlier tomb is thus of great interest for its relation to the later Taj. The squat building, lighted by high arched entrances, topped by a bulbous dome and surrounded by formal gardens - were to be refined over the years to the magnificence of the Taj Mahal in Agra. Haji Begum too is buried in the tomb. The garden has other tombs including that of Humayun's barber and the Tomb of Isa Khan. The latter is a good example of Lodi architecture. Entry is free on friday. On other days, there is a small entry fee. There is an excellent view of the surrounding countru from the terraces of the tomb. NIZAMUDDIN : The shrine of the Muslim Sufi saint, Nizamud-din Chishti, who died in 1325 aged 92, is across the road from Humayun's tomb. With its large tank, it is one of several interesting tombs here. Other tombs include the later grave of Jahanara, the daughter of Shan Jahan, who stayed with her father during his imprisonment by Aurangzeb in Agra's Red Fort. Amir Khusru, a renowned Urdu poet, also has his tomb here as does Atgah Khan, a favourite of Humayun and his son Akbar. It's worth visiting the shrine at around sunset on Thursdays, as it is a popular time for worship, and qawwali singers start performing after the evening prayers. LODI GARDENS : Adjoining the India International Centre are The Lodi Gardens. These well-kept gardens contain the tombs of the Sayyid and Lodi rulers. Mohammed Shah's Tomb (1450) was a prototype for the later Mughal-style tomb of Humayun, a design which would eventually develop into the Taj Mahal. Other tombs include those of his predecessor Mubarak Shah (1433), Ibrahim Lodi (1526) and Sikander Lodi (1517). The Bara Gumbad Mosque is a fine example of its type of plaster decoration. SAFDARJANG TOMB : The Safdarjang Tomb was built in 1753-54 by the Nawab of Avadh for his father, Safdarjang, and is one of the last examples of Mughal architecture before the final remnants of the great empire collapsed. The tomb stands on a high terrace in an extensive garden. Entry is free on Friday. On other day a small entry fee is charged. This Tomb is adjacent to the small Safdarjung airport. HAUZ KHAS : Lying midway between Safdarjang and the Qutab Minar, this area was once the reservoir for the second city of Delhi, Siri. Feroz Shah's Tomb (1398) and the remains of an ancient college can be seen here. It was around this area that Timur defeated the forces of Mohammed Shah Tughlaq in 1398. Also part of the old city of Siri is the Moth ki Masjid, which lies some distance to the east of Hauz Khas, the finest in the Lodi style. KHIRKI MASJID & JAHANPANAH : This mosque dating from 1380 has four open courts. The nearby village of Khirki also takes its name from the mosque. The remains of the fourth city of Delhi, Jahanpanah, lie closeby. Also found close by are the high Bijai Mandal platform and the Begumpur Mosque with its multiplicity of domes. TUGHLAQABAD: The walled city and fort of Tughlaqabad with its 13 gateways the third city of Delhi, are east of the Qutab Minar. It was built by Ghiyas-ud-din Tughlaq and its construction involved a legendary quarrel with the saint Nizam-ud-din, when the Tughlaq ruler took the workers whom Nizam-ud-din wanted for work on his shrine. QUTAB MINAR COMPLEX : The buildings in this complex, in South Delhi, date from the onset of Muslim rule in India. The Qutab Minar itself is a soaring tower of victory which was started in 1193, immediately after the defeat of the last Hindu Kingdom in Delhi. It is nearly 73 meters high and tapers from a 15-meter-diameter base to just 2.5 meters at the top. The tower has five distinct storeys, each marked by a projecting balcony. The first three storeys are made or red sandstone, the fourth and fifth of marble of sandstone. Although Qutab-ud-din began construction of the tower, he only got to the first storey. His successors completed it and, in 1368, Feroz Shah Tughlaq rebuilt the top storeys and added a cupola. An earthquake brought the cupola down in 1803 and an Englishman replaced it with another in 1829. However, that dome was removed some years later. Today , this impressively ornate tower has a slight tilt, but otherwise has worn the centuries remarkably well. The tower is closed to visitors. 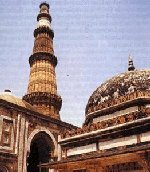 QUWWAT-ISLAM MASJID : The Might of Islam Mosque, at the foot of the Qutab Minar was the first mosque to be built in India. Qutab-ud-din began construction of the mosque in 1193, but it has had a number of additions and extensions over the centuries . The original mosque was built on the foundations of a Hindu temple. Many of the elements in the mosque's construction indicate their Hindu or Jain origins. Altamish, Qutab-ud-din's son-in-law, built a cloistered court around the original small mosque in 1210-20. 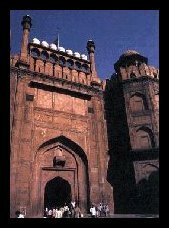 Ala-ud-din added a court to the east and the magnificent Alai Darwaza gateway in 1300. IRON PILLAR : This seven-metre-high pillar stands in the courtyard of the mosque and has been there since long before the mosque's construction. A six - line Sanskrit inscription indicates that it was initially erected outside a Vishnu temple, possibly in Bihar, and was raised in memory of the Gupta King Chandragupta Vikramaditya, who ruled from 375 to 413. What the inscription does not tell is how it was made, for the iron in the pillar is of quite exceptional purity. Scientists have never discovered how this iron, which is of such purity that it has not rusted after 2000 years, could be cast with the technology of the time. It is said that if you can encircle the pillar with your hands whilst standing with your back to it, your wish will be fulfilled. ALAI MINAR : At the same time Ala-ud-din made his additions to the mosque, he also conceived a far more ambitious construction programme. He would build a second tower of victory, exactly like the Qutab Minar, except it would be twice as high! When he died the tower had reached 27 metres and no-one was willing to continue his overambitious project. The uncompleted tower stands to the north of the Qutab Minar and the mosque. Other features: Ala-ud-din's Alai Darwaza gateway is the main entrance to the whole complex., It was built of red sandstone in 1310 and stands just south-west of the Qutab Minar. The tomb of Imam Zamin stands beside the gateway, while the tomb of Altamish, who died in 1235, is by the north - west corner of the mosque. A short distance west of the enclosure, in Mehrauli village, is the Tomb of Adham Khan who, amongst other things, according to legend drove the beautiful Hindu singer Rupmati to suicide following the capture of Mandu (see Mandu in the Madhya Pradesh chapter). When Akbar became displeased with him he ended up being heaved off a terrace in the Agra Fort. 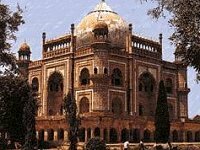 There are some summer palaces in the area and also the tombs of the last kings of Delhi, who succeeded the last Mughals. An empty space between two of the tombs was intended for the last king of Delhi, who died in exile in Rangoon, Burma (Myanmar), in 1862, following his implication in the 1857 Indian Mutiny. CONNAUGHT PLACE : Connaught Place is a vast traffic circle with an architecturally uniform series of colonnaded buildings around the edge - mainly devoted to shops, banks, restaurants, airline offices and the like. Located at the northern end of New Delhi, it is a busy business and tourist centre. JANTAR MANTAR : Built in 1725 by Maharaja Jai Singh II of Jaipur, a keen astronomer, this observatory is dominated by a huge sundial known as the Prince of Dials. Other instruments plots the course of heavenly bodies and predicts eclipses. This massive salmon coloured Jantar Mantar is only a short stroll down Sansad Marg (parliament street). LAKSHMI NARAYAN TEMPLE : The temple erected by industrialist B D Birla in 1938 is dedicated to Lakshmi, the goddess of prosperity and good fortune, and is commonly known as Birla Mandir. RAJPATH : The immensely broad Rajpath or Kings way is where the Repbulic Day parade is held every January 26. Flanked on either side by ornamental ponds, the Rajpath is another focus of Lutyens' New Delhi. INDIA GATE : At the eastern end of the Rajpath, stands this 42-metre-high stone arch of. On it are inscribed the name of 85,000 Indian Army soldiers who died in the campaigns of WW I, the North-West Frontier operations of the same time and the 1919 Afghan fiasco. SECRETARIAT BUILDING : On either side of Rajpath on Raisina hill, lie the imposing North and South Secretariat Buildings topped with chhatris (small domes). They now house the ministries of the Finance and External Affairs respectively. RASHTRAPATI BHAVAN : At the opposite end of the Rajpath from India Gate stands the official residence of the President of India. The palace-like building, completed in 1929, is a blend of Mughal and Western architectural styles, the most obvious Indian feature being the huge copper dome. The Mughal garden to the west of the building occupies 130 hectares. It is open to the public in February. SANSAD BHAVAN : The circular colonnaded Indian parliament building, stands almost hidden and virtually unnoticed at the end of Sansad Marg, or Parliament St, just north of Rajpath. Permits to visit the parliament and sit in the public gallery are available from the reception office on Raisina Road. Tourists will need a letter of introduction from their embassies. THE DELHI ZOO : The Delhi Zoo is on the south side of the Purana Qila. There are a number of white tigers though. The zoo is open daily except Friday, in summer from 8 am to 6 pm and in winter from 9 am to 5 pm. There is a small entry fee. BAHAI TEMPLE : The lotus shaped Bahai temple lies to the east of Siri. Set amongst pools and gardens, adherents of any faith are free to visit the temple and parry or meditate silently according to their own religion. It looks particularly spectacular at dusk when it is floodlit. The temple is open to visitors from April to September, daily except Monday from 9 am, to 7 pm. and October to March from 9.30 am. to 5.30 pm.